Her doctor had advised her to take it easy for a while but could not have factored in the cricket tournament final the following weekend. “Duffers, catch the ball!” came a shout as the team she had supported for five years let go one chance after another. “We” were bowling, and “they”, the favourites, tipped to lift the trophy, were batting. She would not let Husband drive fast and so they had missed the opening over of the match. But once home, she could not take her eyes off the television screen. Watching her mood swing with the match. She was all over the place, as if the ball was being shot about not on the cricket ground but in her own living room. When “we” failed to stop a boundary, she sat down with a thud, crestfallen. The captain let slip the ball through his nervous fingers twice, and both times she reached out for the potato fingers, unseeingly pouring ketchup over her plate and over her skirt as well. Husband was commissioned to mop up the offending ketchup, kneeling beside her so as not to obstruct her view. “Ad break?” she was indignant. 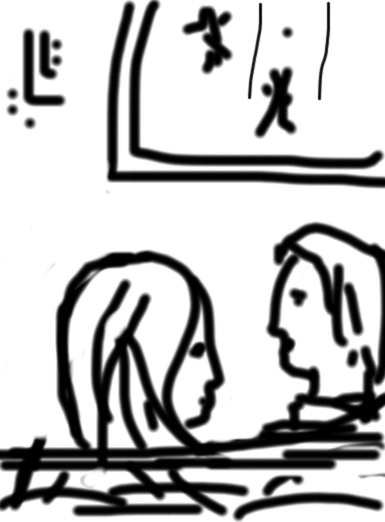 “Why an ad break now of all times, when that guy at the crease will probably be clean-bowled?” she lamented. Husband patted her knee. Mollified by the resumption of the telecast, she forgot about the ad the next moment. There was soon something else to chafe about. It seemed to her the umpire was siding with “them”. He had declared one too many balls “wide”, and suspiciously turned down appeals as well. Meanwhile, the score was climbing inexorably. Which meant “we” would have to bat that much more and fight that much harder. She fretted over the lemonade that Husband got her. One eagle eye on the glass lest she spill the liquid now, he tried to give her company in curbing the runs as best as he could. But the more runs “they” totted up, the lower her spirits sank. That boundary was inexcusable, she wailed. “This is no time to toss the ball like that,” she almost screamed at the next bowler who, regrettably, was deaf to her admonitions. Husband sprang up from his sofa once more. “No, no, don’t go anywhere,” she implored him. “I promise you, in the next over we’ll take a spectacular catch … yippee, see, didn’t I say we’ll do it! Yes, yes, good boy, keep at it!” Husband, hapless proxy for the player on the ground, got a big thump on the back. “Yes, guys, keep at it,” he breathed to himself, expecting a snub in case she thought he was taking a dig at “her team”. Hoping they would keep up with the good work, he sidled into the seat beside her, conveniently at hand in case she wanted to coddle in celebration. Husband put an arm around her shoulder, and was promptly shrugged off. He reassured her that one of “them” would be dismissed, and soon. “Her team” could not bowl out all the opponents, and faced a massive total to boot. She swore under her breath. One-day matches were not good for spending their time together, Husband declared. “Come, let’s lay out dinner meanwhile,” he suggested tentatively. “No!” she was vehement. Hunger was duly told to stand in abeyance. But then the contrary one stomped out, realizing that once “we” began batting, there was no way she would abandon “my side”. “Her side” began disastrously. Dinner could go cold, no matter; her heart was at this moment much colder. One down, with barely a score of runs on the board! Misery, hand-wringing, gulps, pouts and foot-stamping followed in quick succession. The glum mood persisted for the next few overs as “we” stuck to the crease, but only just. As one duo dug in and it looked the score may not be that tough to beat after all, she cheered up. “Buck up, boys, buck up!” and Husband cringed at the surprisingly heavy thump delivered on his back in encouragement. She jumped up and down in delight for the next five or six overs as “we” steadily stacked up runs. “Easy, man, easy,” she cautioned as the ball sailed perilously close past a fielder’s itchy fingers to land on the “right” side of the boundary. Just when all was set for a win came “the” setback she had secretly been dreading. One, two, three batsmen fell victim to “them”. The palpable shock in the air got Husband worried. He stroked her hand soothingly. “Yes, yes, yes!” she was thrilled when God obliged. And again, and yet again … she leapt ecstatically from the sofa to the dining table, scooping up popcorn. “Yes, great, isn’t it? Err, microwave, my dear?” he asked tentatively again. She pulled him down into the sofa, holding his arm tightly. “We are going to win,” she whispered conspiratorially. Disaster struck once more. Five down, six down, and the total suddenly looked darned unattainable. She had an ashen look. Husband poured a soft drink, but she waved it away. “Indomitable,” he muttered, as spirits rose again. “We” were up and running, the total not so formidable any more, when the braveheart was run out. “What now?” she asked him beseechingly. “Indeed, indeed,” she egged on the stragglers. The number of balls left to bowl was equal to the number of runs needed to win. The last boundary, the winner, sent her into a frenzy. “We won, we won!” she whooped as Husband tried to keep her from doing a crazy jig. Her phone was happily busy for the next fifteen minutes. The “duffers” had been forgiven all sins. Husband checked out the freezer, sure that tonight she would be having more ice cream than usual.